Slant Eye For The Round Eye: Arizona's Asian American Candidates: Is There Hope Yet? Arizona's Asian American Candidates: Is There Hope Yet? Maybe. But I'm still not traveling there right now as I think there should be a moratorium after you try and enact crazy laws which basically allow you to beat me to a pulp all in the name of border control. 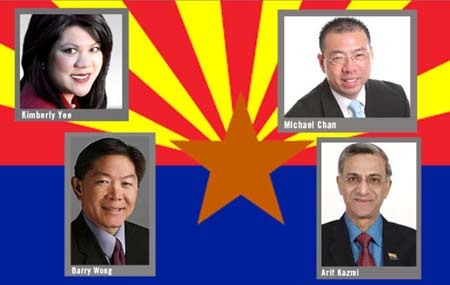 Asian-Americans in Arizona have traditionally kept a low profile in public service. "Over the years, as an Asian-American runs for office, it really raises the visibility, not only to the broader community but also to Asian-Americans to say that it's doable. You can run," Wong said.